Programming a circuit simulation with SPICE is much like programming in any other computer language: you must type the commands as text in a file, save that file to the computer's hard drive, and then process the contents of that file with a program (compiler or interpreter) that understands such commands. SPICE source files are commonly referred to as "netlists," although they are sometimes known as "decks" with each line in the file being called a "card." Cute, don't you think? Netlists are created by a person like yourself typing instructions line-by-line using a word processor or text editor. Text editors are much preferred over word processors for any type of computer programming, as they produce pure ASCII text with no special embedded codes for text highlighting (like italic or boldface fonts), which are uninterpretable by interpreter and compiler software. 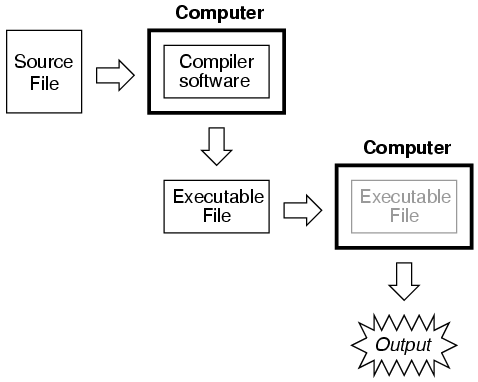 As in general programming, the source file you create for SPICE must follow certain conventions of programming. It is a computer language in itself, albeit a simple one. Having programmed in BASIC and C/C++, and having some experience reading PASCAL and FORTRAN programs, it is my opinion that the language of SPICE is much simpler than any of these. It is about the same complexity as a markup language such as HTML, perhaps less so. Compose a new netlist with a text editing program. Save that netlist to a file with a name of your choice. Run SPICE on that netlist and observe the results. If the results contain errors, start up the text editing program again and modify the netlist. Run SPICE again and observe the new results. If there are still errors in the output of SPICE, re-edit the netlist again with the text editing program. Repeat this cycle of edit/run as many times as necessary until you are getting the desired results. Once you've "debugged" your netlist and are getting good results, run SPICE again, only this time redirecting the output to a new file instead of just observing it on the computer screen. Start up a text editing program or a word processor program and open the SPICE output file you just created. Modify that file to suit your formatting needs and either save those changes to disk and/or print them out on paper. The word "spice" invokes the SPICE interpreting program (providing that the SPICE software has been installed on the computer! ), the "<" symbol redirects the contents of the source file to the SPICE interpreter, and example.cir is the name of the source file for this circuit example. The file extension ".cir" is not mandatory; I have seen ".inp" (for "input") and just plain ".txt" work well, too. It will even work when the netlist file has no extension. SPICE doesn't care what you name it, so long as it has a name compatible with the filesystem of your computer (for old MS-DOS machines, for example, the filename must be no more than 8 characters in length, with a 3 character extension, and no spaces or other non-alphanumerical characters). This alternative "pipes" the text output of SPICE to the "more" utility, which allows only one page to be displayed at a time. What this means (in English) is that the text output of SPICE is halted after one screen-full, and waits until the user presses a keyboard key to display the next screen-full of text. If you're just testing your example circuit file and want to check for any errors, this is a good way to do it. This second alternative (above) redirects the text output of SPICE to another file, called example.txt, where it can be viewed or printed. This option corresponds to the last step in the development cycle listed earlier. It is recommended by this author that you use this technique of "redirection" to a text file only after you've proven your example circuit netlist to work well, so that you don't waste time invoking a text editor just to see the output during the stages of "debugging." Once you have a SPICE output stored in a .txt file, you can use a text editor or (better yet!) a word processor to edit the output, deleting any unnecessary banners and messages, even specifying alternative fonts to highlight the headings and/or data for a more polished appearance. Then, of course, you can print the output to paper if you so desire. Being that the direct SPICE output is plain ASCII text, such a file will be universally interpretable on any computer whether SPICE is installed on it or not. Also, the plain text format ensures that the file will be very small compared to the graphic screen-shot files generated by "point-and-click" simulators. v1 represents the battery (voltage source 1), positive terminal numbered 1, negative terminal numbered 0, with a DC voltage output of 15 volts. r1 represents resistor R1 in the diagram, connected between points 1 and 0, with a value of 2.2 kΩ. r2 represents resistor R2 in the diagram, connected between points 1 and 2, with a value of 3.3 kΩ. r3 represents resistor R3 in the diagram, connected between points 2 and 0, with a value of 150 kΩ. Electrically common points (or "nodes") in a SPICE circuit description share common numbers, much in the same way that wires connecting common points in a large circuit typically share common wire labels. SPICE begins by printing the time, date, and version used at the top of the output. It then lists the input parameters (the lines of the source file), followed by a display of DC voltage readings from each node (reference number) to ground (always reference number 0). This is followed by a list of current readings through each voltage source (in this case there's only one, v1). Finally, the total power dissipation and computation time in seconds is printed. All output values provided by SPICE are displayed in scientific notation. One of the very nice things about SPICE is that both input and output formats are plain-text, which is the most universal and easy-to-edit electronic format around. Practically any computer will be able to edit and display this format, even if the SPICE program itself is not resident on that computer. If the user desires, he or she is free to use the advanced capabilities of word processing programs to make the output look fancier. Comments can even be inserted between lines of the output for further clarity to the reader.